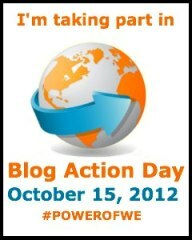 Blog Action Day 2012 – Giving… into The Power of We! I believe that each individual is responsible for their own connection (or lack of) to God. But as well as “I the Christian”, there is also “We the Church”. I’m not talking about a particular building, denomination or institution. I’m talking about the people of God who collectively as the Body of Christ, make up His Church. Everyday, somewhere, you will find part of that ‘Body’ demonstrating the love of Jesus to those in need! One organisation doing exactly that is Tearfund. Here in Ireland there is a small dedicated team who, working through churches and Christian organisations across the world, bring help and hope to people living in dire poverty. They work with forgotten children, vulnerable women, people affected by HIV, and provide emergency relief to those who have lost everything in times of disaster. Meet Moses – he has been hungry all his life! Moses would love to be a doctor when he grows up but his dream seems hopeless when his grades slip during the ‘hunger season’. 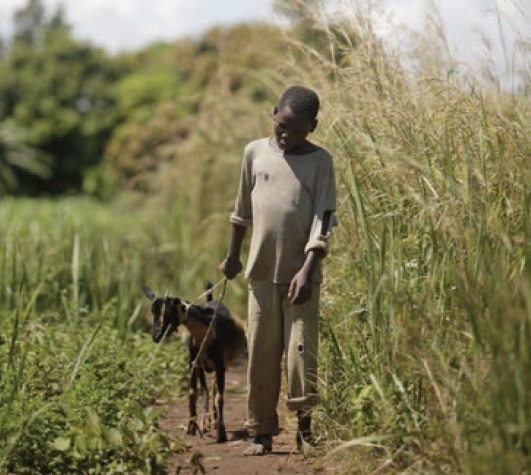 ‘It’s hard to concentrate in school when you are hungry,’ says Moses. He is 13 years old, but because of lack of good nutrician he is the build of a much younger child. It seems incredible that in a fertile country such as Uganda, with two agricultural seasons a year, people go hungry. But last year, Moses’ family survived on a meagre diet of one bowl of cowpeas per day. ‘I remember my father crying at night and asking God to provide for our family,’ Moses recalls. 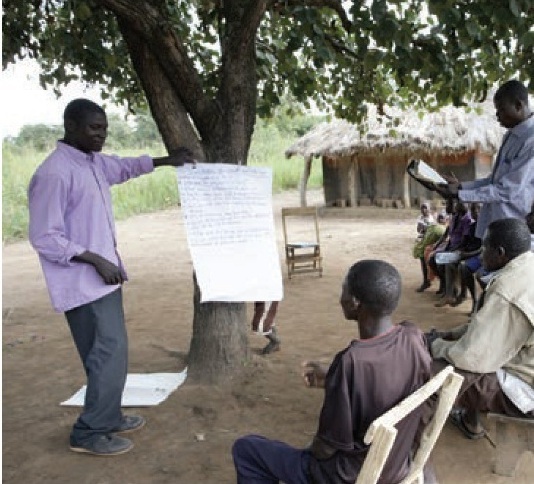 Pastor Joseph leads the village church. In an effort to help local people forge their own path out of poverty, as well as Bible teaching, he began providing agricultural training. He taught people about the best types of crops to plant and how to irrigate them. Moses’ father and mother were eager to learn. They worked hard and, earlier this year, they reaped a bumper harvest. They were able to buy a goat for their family, and Moses and his siblings now enjoy a bowl of nutritious milk every morning before they head off to school. In chapter 6 of the Gospel of John, we read the story of a boy who offers his small meal to feed a large crowd. Jesus gets involved and the multitudes are fed! Part of ‘The Power of We’ is the effect that a collection of even the smallest of financial gifts can have. Tearfund reminds us that a lot of these families they work with live on the equivalent of not much more than €1 per day. Money troubles are everywhere. Most Irish families are struggling. But we in developed countries must remember that poverty is relative! If at all possible we must keep giving; even if it’s just a little. As the saying goes “it’ll help a lot”. If you would like to help the work of Tearfund Ireland or just find out some more about their work you can go to their website. This is normal life, it’s not easy! I enjoyed reading your post. If we live according to what Jesus taught, we will have a different world, that’s for sure. Thank you so much. I enjoyed reading yours too 🙂 There are so many great posts on the subject! Working together in Christ can be powerful. Love this post! Well done indeed!